I was struck by the clarity and the deep golden colors of four brilliant Citrines cut and polished by August Mayer from Idar-Oberstein, Germany. Known for their perfect gemstones, I knew I had to design with these lively stones. I envisioned earrings that are now completed– hand-fabricated in 18k gold with a hidden connecting loop, allowing for movement. Set close together the two stones looks as if it were one. Derived from the word ‘citron’ meaning yellow in French, most Citrines are not actually yellow–they range in hues of yellow and orange-golden colors. 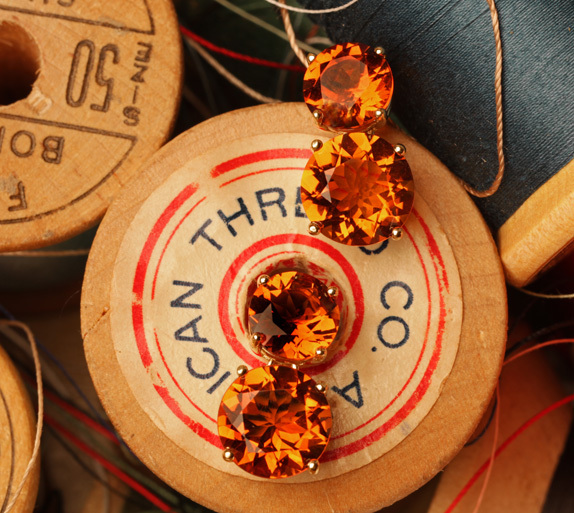 Gem quality Citrines have a deep golden orange color with a hint of brown and are usually referred to as Topaz. Mistakenly called “Madeira Topaz” or “Topaz Quartz”, citrines are exclusively quartz that grows in a hexagonal crystal and is not related to the mineral Topaz. Although found all over the world, Brazil is the primary source. Ametrine is a form of quartz, found in only one mine in Brazil; this beautiful quartz combines the color of Amethyst and Citrine. Lapidaries create unusual carvings from Ametrine which collector’s value because of the division of color and the uniqueness of a particular carving. The ‘Tassel Necklace’ which I designed has a large dimensional swirl faceted Ametrine. Hand-fabricated in 18k Gold $1,850.00. This jewel has sold.